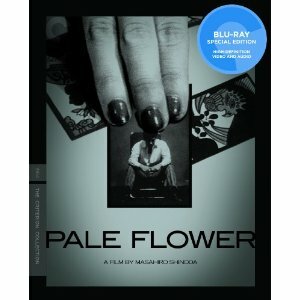 Pale Flower is an early Japanese New Wave film, but really it is just the structure of a classic film noir in many other regards. Style aside, the film is about a doomed man and a femme fatale that leads him down that path. This is simplifying the touching--albeit dark and twisted--crime film, but the experience of watching Pale Flower cannot really be explained properly. It is both modern and original while remaining familiar and classic. The film follows aging yakuza member, Muraki (Ryo Ikebe), joining him as he is released from prison after serving three years for murder. One of the first things he does on the outside is to find a gambling hall, where he meets a beautiful gambling addict named Saeko (Mariko Kaga). Saeko drives fast and gambles loosely, so she is easily paired with the aging assassin. The style of Masahiro Shinoda’s film was groundbreaking at the time, almost dream like with the pairing of Toru Takemitsu’s jazzy score. It is a stylized crime film which precedes any from Tarantino or Scorsese, much less the other Japanese directors of the time. Even today it has a visceral edge to hit, which lends nicely to the high definition presentation of Blu-ray. It wouldn’t be difficult to imagine this film remade today without anything needing to be changed other than the stars. The Blu-ray includes a new high definition digitally restored presentation, with a uncompressed soundtrack. The special features include a new video interview with director Shinoda, along with newly improved subtitles for the film’s dialogue. The other special features include select-scene audio commentary by film scholar Peter Grilli. There is also a booklet insert, which has photos and an essay by film critic Chuck Stephens.